My Data Guard database was running on 11.2.0.3 version and the DB size was around 10 TB. Some time back, the primary database Hardware was crashed and whole DB server went down and UNIX admin not able to bring the server up. It is VERY critical and high SLA database, management wanted to bring it up as quickly as possible. Here is what i have done to bring the application up. I would like to share this and thought it might be helpful for others. Flashback feature is not enabled on the database. Step 1 Activate the standby database. As a first step, we need to activate the current standby data base to bring the application up. Step 2 Point the application to current primary(activated the standby from step 1). Application team will take care of this. DBA can provide the DB/Host info just in case application engineer needs it. Step 3 Rebuild the standby database from tape. Now the old Primary database is useless. We will have to restore from the scratch. We have several ways we can restore the DB. But I restored the DB from tape. Since i did not want to clone the DB from current primary. The reason is, i did not want to add additional load on the current primary database. Disable archive log delete job in current Primary database. The reason is, we need to apply the archive log files after building the standby database. It is safe to disable the archive log delete job. I just want to save all the archive logs on the server. Once UNIX SA bring the server up, drop the database and restore the database from the scratch. We don't need to restore the database from scratch if flashback is enabled on the database. But apparently, the flashback is not enabled on my environment and end up restoring the database from scratch. I used RMAN to drop the database. You can use different approach if you like. Step C Verify the backup list from tape. Here is the sample command to check the tape backup list..
From the above command, we can find out the control file and spfile and backup info. Restore the spfile from tape by using below script. I masked XXXX in some places due to security reason. Please use the appropriate name according to your environment. I restored the sfile under /work area. Restore control file from tape using below script. Move the control file to appropriate location. Step F Start the instance. Step G Restore and Recover the database. This step took me 10 hours. In your environment, restore time would be depends on your DB size, number of CPU on your host. Go to Current primary and get the below SCN. Apply the above SCN +1 on the below script. Here is the shell script i used to restore the database. I ran this script in nohup background mode. I used 8 channel since my host has 8 CPU with hyper threading enabled. Here is the log file info for the above restore step. Now the DB is converted to standby database. Run the below SQL to check the status. In my environment, the status shows as below. Enable the log shipping in primary database. In my environment, log_archive_dest_stat_2 is pointing to standby database. Open the primary and standby database alert log and tail the log files on different putty window. 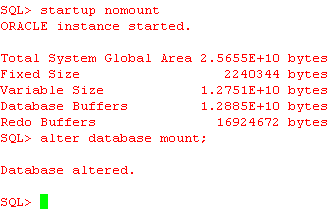 Login to current primary database and run the below command. and run the below command. Monitor the alert log while running the below commands. -- wait for 5 minutes and double check the alert log and make sure no issues. Verify the log shipping and DG replication. Verify the alert log on both database and make sure no errors. 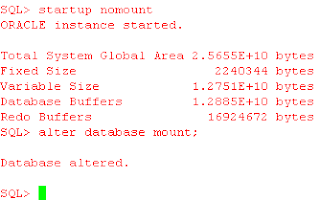 Enable the archive log delete join in primary database once standby is caught up with primary database. Lesson learned : Enabling flashback is highly important on data guard environment. Otherwise, we will have to rebuild the database from the scratch if the DB is crashed. I enabled flashback features on all the data guard environment after i went through the costly exercise. Hope this post helps! Please let me know if you have any questions or comments.